White Wine Making Experience Gift. Adopt a row of vines in a French organic vineyard, and experience what it's really like to be a winemaker. The Gourmet Odyssey Wine Experience gives you the unique opportunity to become a winemaker for a winemaking year. You'll adopt your own vines and follow the making of your own personalised bottles of organic white wine at one of our partner wineries. We currently have two partner vineyards in the white wine range for you to choose from, both producing excellent organic white wines. Domaine Stentz-Buecher in Alsace and Domaine Chapelle in Burgundy are both organically certified. Both wineries pride themselves in producing wines as naturally as possible that best express the terroir from which they hail. So what will you choose, Burgundy or Alsace? 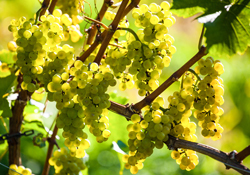 You can choose to adopt-a-vine and follow the making of your white wine from one of our partner vineyards listed below.